We are all somewhat jealous of J K Rowling’s fame and fortune. But is that any reason to become spiteful? When the news came about the book she’s been writing, it was as if of necessity it has to be bad. Harry Potter wasn’t bad. Not high literature, but still well written and a most enjoyable read. There is no reason why the new book should be bad, or embarrassing. After all if you have all that money and the time to write and willing publishers; would you ruin your reputation by offering us a poor novel? It’s not as if Harry was just one or two books. J K kept it up all the way to the seventh book, under pressure, with journalists sneering almost as often as they praised. So we know that she can. And there is no way she could offer the world another Harry. It will have to be different. Maybe even so different that it needs to be an adult book. I don’t know. That’s the one thing that leaves me thinking lots of fans will be disappointed. But I’m looking forward to it. And surely it will be good for bookshops? The first post-HP is destined to sell. 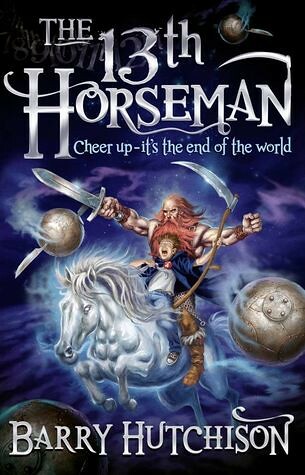 That could be a quote on the cover, when they reprint Barry Hutchison’s The 13th Horseman. It shouldn’t take long, I reckon. They’ve got that Neil Gaiman saying that he ‘really liked it,’ which is why I felt I could pipe up with my piece. While I’m still talking about covers, this one would make the unsuspecting buyer think they were getting something Terry Pratchett-ish. And they’d be quite right. So, as you will have gathered, I quite liked it. Loved it. You know. But I wanted to be restrained over the whole thing. The end of the world is coming and the Four Horsemen are missing a Death, so they adopt Drake Finn. Having gone through a number of Deaths over the years, he is their tenth. While waiting for the end they play children’s games in Drake’s shed. Except they don’t have a shed, according to his mum. The Apocalypse isn’t as far away as all that, and before long the Four Horsemen have work to do. Can Drake do his bit? Well, I obviously can’t tell you that. But if you are reading this, then the world didn’t end. Yet. This is an incredibly funny book, and I do like my humour. For all their faults I found myself liking all the Horsemen, although best of all Pest. Even Famine grows on you a little. Excuse the pun. My copy of the book came with a bookmark that’s almost as amusing as the book itself. Apparently they have put in a mistake on purpose. (Of course they have.) It’s not quite as they say however, but I worked it out. And there is one word too many. But that’s all right. It’s a very nearly perfect book. I must have told you about..? It seems not. 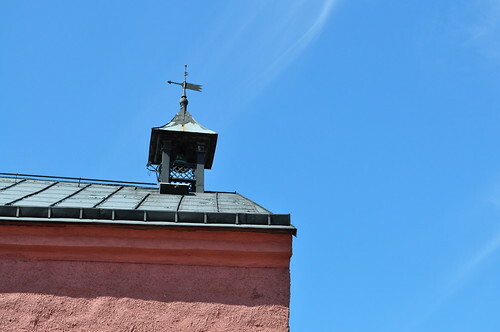 Last week the translating Son had a short piece on Strindberg, written by Inga-Stina Ewbank, to translate in the wrong direction. It would appear that translating from your native language also has its merits. (You know of course that I would like to call it Son’s mother tongue, but that’s where we get complicated. So I won’t.) What made it all the more odd as far as direction is concerned is that the piece was written in English by a Swede about a Swede. I had grumbled the week before that if I am to proof read stuff, it would help to see the original, so this time he emailed it to me. He has had so many outlandish texts to work from that it was a pleasure to see one that was a pleasure to read. Being one of those people who love to repeat themselves (well, I don’t love it, but I have tendencies in that direction, and I’m working hard to give it up), I have developed this way of asking ‘I must have told you this loads of times already?’ and that’s what I did when I emailed Son back. When Professor Ewbank came ‘home’ to Gothenburg to give a talk at the English department in 1978, we students of average mediocrity were excited by the idea of ‘one of our own’ having made it to Professor of English in London. A specialist on the Brontës, even. It was her glowing introduction which caused Inga-Stina to look forward to hearing herself speak. It wasn’t until this week, however, that I found out that she only learned English at the age of 19. And her name, it’s just so Swedish! I was going to use this photo for something last night, and couldn’t. And then I thought it’d be a waste having ‘found’ it if I didn’t use it. So let’s pretend it’s warm and sunny and we are on holiday. Having spent a lot of Saturday doing some most unwitchlike things, I deserve a day off. Almost a day off. And if I don’t, well it’s too late now. Can’t you just feel that sun on your bare shoulders? If I’d told you about this earlier, you’d just have forgotten, so it shouldn’t matter that you only have until midnight tomorrow, 26th February, to win a copy of Adrian McKinty’s The Cold Cold Ground. It is a truly great crime novel, so go for it! Moving across the water (the name of which escapes me right now) to Scotland, Nicola Morgan and her book Wasted won the older category in the Scottish Children’s Book Awards on Thursday. See, it might take a while to start winning, but once you do, it goes on and on. I hope. I mean, I know. Because I’m a witch. The younger age categories were won by Ross MacKenzie with Zac and the Dream Pirates, and Dear Vampa by Ross Collins. Well done Rosses! Lots and lots of children’s authors descended on London this week, for some fancy do on the South Bank to mark the start of the Imagine Children’s Festival. They had to dress up, which I’m sure came as a shock to some, used as they are to working in their pyjamas all day long. I have discovered that some female authors have legs, after seeing photos of them wearing their LBDs. I mentioned the Queen of Sweden being discovered at the Olympic Games in Munich forty years ago. The discovery. Not the mention. That was this week. Little did I know (I’m in exile, after all) that the next day a new little Princess would be born, but let me offer a big welcome to the future reader of children’s books! Princess Estelle Silvia Ewa Mary, Duchess of Östergötland. I expect her mode of transport will improve as she grows older. And did you know they are on facebook? 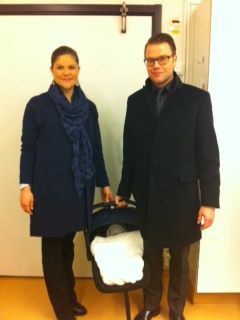 The Swedish Royal family? That’s how I know that today you can (should you be in Stockholm) attend a children’s half term holiday hunt round the Royal Palace. Let them play! Having found that the two Ann Turnbull novels about Friends Will and Susanna are to be followed by a third, completing a trilogy, I felt the need to go back to the first two. They are the kinds of books you don’t forget. You might not remember the details, but the story stays with you. What makes No Shame, No Fear and Forged in the Fire stand out so is the beautiful love story. But also the background to what today might be seen as a ‘mild form’ of religion, but which in the 17th century was an abomination which the authorities needed to stamp out. That people as peaceful and normal as Quakers are should be seen as a threat, is something we need to remember today, when there are plenty of other goups of people which some of us fear enough to want to persecute. It’s as with many other things; if you exchange a word or a name for another, you suddenly see quite how wrong and unnecessary any such behaviour is. Hopefully, one day we’ll all have blended in. No Shame, No Fear introduces us to Will and Susanna and their love for each other. Set in the Shropshire countryside, and in a small town in 1662, Susanna’s family are Friends, whereas Will’s father is a wealthy authority figure who opposes the illegal Friends. And when Will finds himself drawn to them it leads to their estrangement. This is another story featuring strong women in history. Susanna goes to work for Mary, a professional woman and Friend, where she learns to read and write, and eventually to work in Mary’s printer’s workshop. Meanwhile, Friends are being thrown in jail for their beliefs, and Will and Susanna work together to make sure the children left behind are safe. And all this time Will’s father tries to extricate his son from what he sees as the arms of a calculating whore. Three years later in Forged in the Fire Will is living and working in London, expecting Susanna to join him as soon as she is free from her apprenticeship with Mary. And that’s when the plague breaks out. When Susanna hears nothing for a long time, she sets off to London to find Will. Things are not easy for them to begin with, and once they settle it’s time for the fire of London. The accounts of both the plague and of the fire are scary. It’s easy to shrug them off as awful things that happened a long time ago, but when your Friends are involved it feels different. I can see the story’s hook, now that I know there is a third book on the way. Will’s and Susanna’s friends moved to America a few years earlier, and it’s what people did when they were persecuted for their faith or couldn’t make a living where they were. Sounds familiar, doesn’t it? When I received my first book catalogues from publishers I was childishly pleased. And I still am. Sometimes. I was talking to a book world friend a few weeks ago about a recently received annual catalogue, and remarking that for all the books it listed, I was only interested in one. In a way that was good, because it eases the burden of how to find the time to read. But what upset me was the large number of romances. That’s the only word to describe what they are. My foreign youthful equivalents of Mills & Boon have now been replaced by books with dark covers depicting vampires and dystopias and the like. One such book I can show an interest in. Several even, if they don’t all come at once. Except they do. The catalogue I have in mind had pages and pages of them, and when you see all the covers side by side, the similarities are more striking than when you see them on their own. Being a bit gaga I peer at every new book and wonder whether I’ve already seen it. But most likely it was just one of its mates, looking almost the same. The books are OK. I’m sure I’d enjoy reading a few if I had nothing else to read. But like the Mills & Boons they are not really review material. Or at least, I don’t think so. I’d never have dreamt of reviewing a romance back when I consumed them, nor would I have looked for someone else’s review of them. You buy or borrow, read and discard. But luckily there are other catalogues. Some are excellent and contain not only the new books soon to come, but list all the old books still available. And when they are good ones it makes you go a bit crazy, until you realise you can’t order half the back catalogue. You just don’t have the time. And then there are the ones that list books to appear over the next few months. Like the Walker Books Seasonal Catalogue which just arrived. The cover is nice. It’s from the May lead title, and looks like something I’ll want to read. A war time Shirley Hughes novel. On past lots of picture books. Then comes a new Sonya Hartnett. At least I think it is. The blurb sounds a little like another one, but I’m sure it’s new. After which I get to the first and second books in Ann Turnbull’s ‘epic Friends trilogy.’ Whoa! It is a trilogy? I didn’t know. If so, where is number three? Hang on, perhaps the first two are there to herald the arrival of the third? More picture books, and then what might be the end of Helena Pielichaty’s Girls FC football books. Old Horowitz. Yes! It is a trilogy! And I haven’t missed a thing, because here comes the ‘long-awaited conclusion’ of Ann’s Friends trilogy, Seeking Eden. Not now, obviously. In the summer. But at least I hadn’t lost my mind. More novels, more picture books (if that is possible) and some Baker Street Boys, of which there are many. Anthony Read has been busy. I can almost cope with this. There are books I like the look of, ones I love the look of and some which look fine but that I will not have time for. And then there are lists and catalogues from all the other publishers… As well as the non-existent lists from others. Detective work can be such fun.